For some the very thought of handcrafting their wedding will make their blood run cold, for others finding a venue that is a blank canvas on which to build their creativity would be a dream. However, if there’s one thing I would like to warn DIY couples against, then that would be thinking that arranging a handmade wedding is both easy and cheap. Deciding to hold and organise a homespun wedding comes with a whole new host of responsibilities and management. Lets begin with the challenge of finding a venue that offers a blank canvas in the first place. Both myself and Jess have experienced just how difficult it is to find such a venue but, there are some great websites which can help. Coco Wedding Venues usefully narrows down the search based on the type of venue and style that you are looking for, whilst Find Your Perfect Venue is particularly useful as you can base your search on venues that specialise in DIY weddings, as well as location and style. 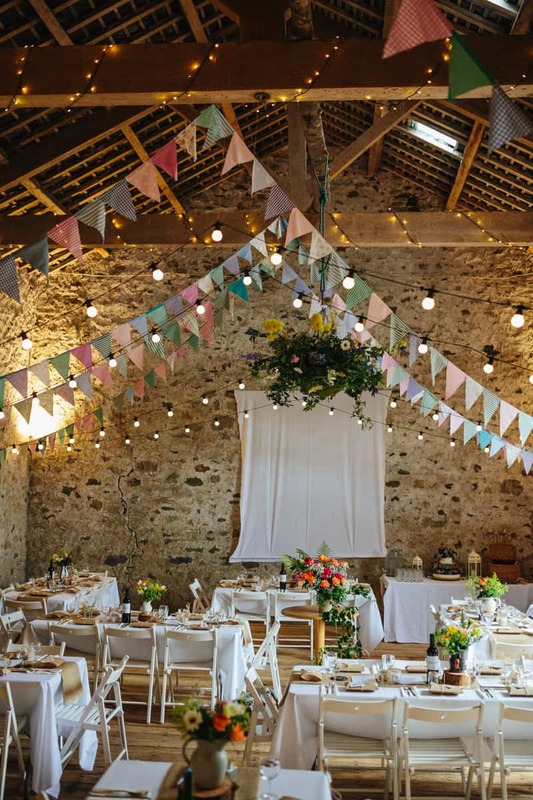 The most obvious choice of venue for this type of event tends to be yurts, marquees and barns but don’t be too disheartened if this isn’t what you are looking for, there are some great venues out there, you just need to do that extra bit of digging to find the perfect one. Right now lets get down to nailing that perfect venue! Use this checklist to make sure you have absolutely everything covered when planning your DIY wedding. ♥ Do you have Liability Insurance? ♥ What will happen if my wedding is cancelled? Check the T’s & C’s! ♥ From what time will we have access? ♥ What are the noise restrictions in the area? ♥ Do you have a generator? ♥ Will there be adequate heating or air conditioning? You may need to provide extra heaters or even air conditioning units! ♥ What are the access restrictions? Some venues will be unsuitable for larger vehicles like coaches? ♥ Does the venue have disabled access if needed? Dont forget your less able guests! ♥ What facilities are available, Car park, toilets etc. What facilities will not be available i.e. dance floor? ♥ Are we able to book outside suppliers? I.e. Bouncey Castle, Garden Games, ice cream vans? ♥ Who is responsible for lighting? ♥ Can we store decor, equipment etc in advance at the venue? Don’t forget you may need to take your own ladder as venues will not be able to provide you with these by law. ♥ Are there any items we are not permitted to use in the venue? I.e. Candles, screws, nails, glue, confetti, lanterns. ♥ Who is responsible for clearing away decorations and rubbish? Will it need to be done that night? Who should we allocate to do this? Do we need to hire in a waste removal bin? Especially if you’re doing ‘take away’ food in the evening? ♥ Do you have tables or will we need to hire this? What size are they? How many? ♥ Is this available in house or will catering need to be out-sourced? ♥ Do you have public liability insurance? ♥ Do you provide all the equipment i.e hot plates to keep food warm, or coolers to keep drinks cool? ♥ What style of crockery do you provide? ♥ Who will serve the table wine? ♥ Is there a Corkage Charge? ♥ When and who will they set up the tables? ♥ Who will put out favours ? ♥ Do you provide linen hire or will this need to be outsourced? Don’t forget napkins! ♥ Chairs and chair covers! Check out the chairs? Do you like them? Will they fit with your ideal style and decor? Will you need to hire chair covers or will these be provided? Again will these fit your style? If not you will need outsource this to another company? ♥ Dont forget to arrange the ‘Order of the day’ with you caterer and make sure this is given out to all parties involved! ♥ Are bars available at the venue or will this need to be out-sourced? ♥ What time can alcohol be served on the premises? ♥ Can we bring our own alcohol? ♥ Do you have a list of wines and cocktails that we can choose from? ♥ What time will you be setting up? ♥ What time are you playing? ♥ Will you supply a pa for speeches? ♥ Will you provide background music? If not who is in charge of keeping the music flowing on an Ipod or MP3 player if there is one? ♥ Who will greet your guests when the arrive and how will they be shown through to the ceremony or reception? Does the venue come with an events manager? ♥ Make sure your venue is licensed for civil Ceremonies and check which local authority the venue belongs to. ♥ Also check out the venues insurance policies when it comes to loss of property or damage. I am a Hospitality Management Meeting and Event Planning student at Northampton Community College Monroe Campus located in Tannersville Pennsylvania. I am browsing different websites just to get ideas for my class project. I must plan a wedding from start to finish! Your site was helpful, easy to navigate, and very exciting. I get lost looking at all the gorgeous photos.